Learning takes place everywhere, throughout a lifetime—and museums are an important part of the informal learning ecosystem. But how do we make these learning experiences count? How can we convey to future schools and employers that lessons outside the classroom provide valuable skills? The concept of digital badging, being explored throughout the worlds of education and credentialing, seeks to answer these questions. Most people are familiar with the concept of badging from the scouting world, in which Boy Scouts' and Girl Scouts' physical patches match up with accomplishments, projects completed, and lessons learned. Digital badges are awarded online, but like scout badges, they represent a fun, moderately competitive way to track progress. Organizations like LRNG and the Digital Media and Learning Research Hub are developing online systems to formalize and support communities dedicated to digital badging. Badging programs have come and gone over the past few years, but examining the badging programs that have lasted and those that have not provide valuable lessons about what successful badging looks like. This paper looks at museums’ past and current involvement with the emerging world of connected learning and digital badging, through the examples of San Diego’s Art and Science of Vision and the Pittsburgh Galleries Project. It compares the models of these, and other digital badging projects, highlighting successes and challenges, and placing them in the larger context of current educational philosophy. Museums pride themselves on being public resources, with plentiful primary source materials and educational content. Museums are also in a constant search for relevance. By finding ways to incorporate into, and help advance digital badging, museums can take a more active role in shaping and supporting the future of education. Education is vital to museum missions. From field trips, to lectures, to interpretive text, educational offerings are key aspects of museum work. Despite the importance of education, museums often struggle to determine the best way to serve their audiences and present meaningful and relevant information and experiences. At the same time that museums struggle to find their role as educators, the United States’ education landscape faces numerous challenges. Ballooning higher-education costs, skills mismatched between available opportunities and the workforce, and the threat of funding-cuts to public education are just a few of the factors that lead to unmet needs: we feel that museums could help meet these needs. There are many ways museums could addresses educational challenges; the emerging world of digital badges, which is still taking shape, may well be an important one. What are digital badges? The Humanities, Arts, Science, and Technology Alliance and Collaboratory (HASTAC), a group that connects organizations involved in online scholarship and digital humanities, explains that a digital badge is “a validated indicator of accomplishment, skill, quality, or interest that can be earned in many environments” (HASTAC, n.d.). Most people are familiar with the concept of badging from the scouting world, in which the Scouts’ physical patches match up with accomplishments, projects completed, and lessons learned. Digital badges are awarded online, but like scout badges, they represent a fun, moderately competitive way to track progress. This competitiveness ties digital badges to the educational trend of gamified learning, in which the principles that make games fun and addictive are applied to other activities. Apps like the gamified language-learning tool Duolingo and Untappd, which awards badges for the variety of beers tried, have helped introduce adults to gamification and digital badges. The differences between these two apps displays the wide variety of audiences and applications digital badges can have; badges have the potential to prove students are college-ready, or encourage adult consumers to buy more coffee. One of the most promising applications of badges in the museum community is their ability to turn informal learning experiences into formally recognized and accepted educational credentials for visitors and learners of all ages. The idea of digital badging as credentialing is not new. It got a lot of buzz around 2012 and 2013, but has been slow to take off since, especially in the world of formal education and credentialing. The 2010 involvement of Mozilla and the MacArthur Foundation, the software company dedicated to free and open-source services and the philanthropic organization, is often cited as when digital badging began gaining credibility as an educational tool (Iafrate, 2017). Since then, a range of organizations have seen potential in digital badging programs. Businesses, non-profits, and museums have taken on pilots of badging programs. Some have flourished, while others lasted a year or so then disappeared. Most familiar to the Museums and the Web audience is Dallas Museum of Art’s DMA Friends program, which used badging as a membership model, and awarded visitors badges based on events and exhibitions attended; that program ended in December 2017. Other badging programs, like the Shedd Aquarium’s Great Lakes Science Badge, which counts towards teachers’ credentialing hours, have kept a strong presence. The mixed results of badge programs have led many to become what’s called “badge skeptics” (Resnick, 2012). While some skepticism is warranted, badges have had a serious presence on the scene for less than ten years. It may seem like a slow start to this framework, but if the aim is to rethink the entire landscape of education and credentialing, a little less than a decade is a very short time to make major transformations. Indeed, many developments in badging occurred after this paper was conceived and while it was being written. As part of MacArthur’s work to make their vision for badging a reality, they fund a series of grants to organizations looking to pilot badging programs. This paper is particularly interested in 2016’s MacArthur-funded 6th Digital Media and Learning Competition (DML 6), in which the complex web of organizations invested in supporting and growing the badging landscape is deeply involved. Two out of 11 projects funded in the DML 6 competition, the art-focused Pittsburgh Galleries Project, and San Diego’s STEAM-based Art and Science of Vision, relied on museums as providers of educational experiences and opportunities. These two DML 6 projects came from entirely different angles and met varied levels of success, but each provides valuable information for museums considering badging or credentialing initiatives. Looking at the history of digital badges in and outside the museum sector, the complexity of the digital badging landscape, and the case studies of the Pittsburgh Galleries Project and the Art and Science of Vision, this paper seeks to answer whether digital badging as credentialing is worthwhile for museums, or whether “badge skeptics” have been right all along. It attempts to separate lasting badge programs from those that have come and gone, in order to identify what factors create viable long-term educational offerings. Museums pride themselves on being public resources, with plentiful primary source materials and educational content; museums are also in a constant struggle to figure out how best to use and share these resources. While it may still be unclear whether badging is a passing trend or the direction that education is headed towards, by keeping up with digital badging and incorporating its underlying ideas into their work, museums have the potential to take a more active role in the educational landscape, and contribute solutions to the problems facing education today. While the idea of digital badges as credentials has been slow to spread, badging programs have been tested relatively widely, both in and outside the museum field. Some badging programs are celebrated and long-lasting, while others started up and stopped relatively quickly. The well-resourced badging programs of the for-profit world seem more obviously successful, but certain museum (and museum-adjacent) programs have succeeded as well. Each program provides an example of what badging could look like, and the challenges badging as credentialing faces. Looking for common factors in the successful programs helps point a way forward for those interested in digital badging. Outside the museum field, IBM has been one of the most enthusiastic adopters of digital badging as credential, and serves as an example of what a successful badging program can look like. IBM implemented digital badging in 2015 as a way to prove the learning that took place on their professional development platform, the Online Skills Gateway. In their February 2016 slideshare on digital badging, IBM announced it had awarded 495,000 badges to 258,000 earners in 183 countries. They claimed that their online courses saw triple digit increases in all metrics with the introduction of digital badging, and made the following enthusiastic self-assessment: “the results have been nothing short of spectacular.” (Leaser, 2016). In September 2017, IBM built on the success of its digital badging initiative when it announced a new partnership pilot with Northeastern University, wherein badges earned through IBM could count towards certain Master’s Degree programs (Leaser, 2017). IBM’s strong reputation and partnerships, existing learning content, and need to convey the credentials it awards, all seem to have contributed to the program’s success. The continuing and recent developments in digital badging programs in major employers like IBM prove that bagding is far from dying out. While museums have been working with digital badging since the idea began gaining traction, they have seen results much more mixed than those of IBM. In 2012, The Center for the Future of Museums included a blog post that highlighted two digital badging projects in the field that were emerging at the time (Rodley, 2012). Museum Computer Network’s badging program, intended to encourage their members to participate in professional development opportunities, has not lasted. The other program highlighted, Dallas Museum of Art’s DMA Friends program, which stood as the museum’s membership model and used digital badging to engage visitors by encouraging event attendance and repeat visitation, ended in December 2017 (Dallas Museum of Art, n.d.). Most mentions of digital badging in past Museums and the Web papers have been about DMA’s platform, and attempts to scale it to museums nationally, using a grant from the National Leadership Foundation (Stein et al., 2015). However, with no substantial news about the other museums in the National Leadership Grant and DMA’s own announcement that they ended DMA Friends, there is plenty of reason to join the ranks of badge skeptics. That being said, the DMA Friends program was a creative project that introduced the field to the idea and potential of badging as a tool in museum spaces. Not all badging programs in the museum sector have faded away. Chicago’s Shedd Aquarium has been a leader in badges as credentials since 2013. Looking to reach their audience of teachers seeking professional development in a more cost-effective and scalable way, the Shedd was inspired by the Chicago City of Learning program, which sought to break down barriers between formal and informal learning and highlight educational opportunities throughout the city (https://chicagocityoflearning.org/). The Shedd had a partnership with the Illinois State Board of Education that allowed teachers to count professional development offerings towards certification clock-hours. They drew on this connection to develop a program in which badges could be earned for general interest, certification hours, or graduate credit at the nearby National Louis University. While some of the badges they offered that were grant-funded or associated with temporary exhibitions have come and gone, the Shedd’s core badge, their Great Lakes Science badge, remains a strong and popular professional development offering (Kerr, 2018). As with the IBM program, the elements that helped the Shedd program succeed include a strong reputation, partnerships, existing learning content, and a desire to scaffold their content in a new way. The Shedd shows that museums have the potential to build badging programs that last. One of the biggest challenges to digital badging’s growth and spread has been the lack of consistency in credentialing. Successful badging programs have included credentials that lead to real-world opportunities for participants. In many programs, this has been built on existing organizational relationships and hard-earned trust. As Mozilla and MacArthur first brought up, for badging to be scalable, there need to be agreed-on standards, so that even organizations without prior relationships can trust in the value of one another’s certification. Many organizations are working towards this goal, including Mozilla, MacArthur, HASTAC, and numerous others; this paper simply scratches the surface of the organizations working to create, certify, track, and issue digital badges. The difficulty in understanding this large, dispersed landscape represents yet another challenge to making badging mainstream. Hopefully, the world of digital badging begins to consolidate, as it did in January 2017, when Open Badges, originally launched by Mozilla, agreed to have its responsibilities taken up by other organizations. The Open Badges site explains “IMS Global Learning Consortium, the world’s leading open standards consortium for education technology, in partnership with Mozilla Foundation and Collective Shift/LRNG, has agreed to become the organization responsible for managing the effort to advance the development, transferability and market adoption” (Mozilla Foundation, n.d.). Despite mergers like this that help bring similar work together, the world of digital badging remains a large, dispersed field that is difficult to wrap one’s mind around. In Open Badges’ merger explanation, they mention LRNG (which looks like an acronym but is not), an organization which has become a leader in the digital badging field. LRNG is the first project of Collective Shift, a social enterprise “dedicated to redesigning social systems for the connected age,” and a MacArthur Foundation spinoff led by MacArthur alum Connie Yowell (Yowell, n.d.). LRNG aims to reshape the face of learning by working “with cities and organizations to connect learning experiences to career opportunities, ensuring that all young people, especially those from underserved communities, have inspiration and guidance to prepare them for life and work in the modern economy” (LRNG, n.d.). LRNG has developed partnerships with major employers including Electronic Arts, Fossil, and Gap, all of whom are interested in improving the way credentials are issued and shared. LRNG even has celebrity backing; musician John Legend supports the organization and appears in its promotional materials. With major corporate and celebrity partners, LRNG is a rising digital badging star. LRNG’s main tool to achieve its mission is a platform that hosts and tracks physical and digital experiences (or XPs) that learners complete, and the badges they earn. The platform draws on the metaphor of playlists to describe the series of activities that learners must complete in order to receive badges and unlock associated opportunities. Organizations that design XP content can log into an intuitive content management system, at least as simple as WordPress. They can license content under Creative Commons to allow other designers to “remix” it into different playlists and combinations of learning materials. Organizational accounts also include a system that allows them to view, approve, or suggest edits to learner submissions. On the learner side, any interested individual can create an account. When learners log in, they can see Playlists available to them, complete XPs, see past submissions, and view, download, and share badges they’ve earned on their LinkedIn profiles or other social media. Within this framework, organizations can get creative with the types of content, experiences, and credentials that they offer. In a notable instance that illustrates the power of LRNG as a platform, the organization partnered with One Summer Chicago, the program that grew into the Chicago City of Learning program that inspired the Shedd’s digital badging. One Summer Chicago provides targeted employment opportunities to the city’s youth. As the case study of LRNG’s involvement explained, “One Summer Chicago initiative brings together government institutions, community-based organizations and companies to provide employment and internship opportunities to youth and young adults 14 to 24” (LRNG Chicago n.d.). The program had a particular need not being met: effectively preparing youth for the professional, adult world they would encounter in their work. LRNG stepped in, working with One Summer Chicago partners to host playlists and badges that would help them prepare. At the end of summer 2016, 7,000 One Summer Chicago students participated, earning 22,500 badges. The case study includes quotes from students, who were glad to have resources on paying taxes and tips for saving the money they had earned. This initiative was a powerful example of digital credentialing with a purpose, facilitated through the LRNG platform. Much like with other successful badging programs, the city of Chicago had a far-reaching reputation, strong partnerships, existing information they wanted to convey, and a need for a tool that could present and certify educational content. With LRNG’s potential, and its ties to the MacArthur Foundation, recipients of DML 6 grants were asked to use it to implement their badging projects. The DML 6 projects explored below—the Pittsburgh Galleries Project and Balboa Park’s Art and Science of Vision—each used LRNG for their projects, and understanding their use of the tool is a key to understanding how these badging projects evolved. Overall, the organizations had positive experiences with the platform and saw its functionality steadily grow and improve throughout their projects. As a tool, LRNG enabled a number of organizations to gain better understanding of what digital badging could look like, and to implement badging with a more formal, user-friendly framework. While LRNG began as an invite-only free service, like all organizations, they need to achieve sustainability; with the start of 2018, LRNG put up a paywall to organizations looking to host learning content and badges on their platform. While LRNG may have been a great way for curious organizations to try digital badging, the adoption of a fee puts up another challenge to cash-strapped museums who think they might be interested in badging. Other free and open platforms such as FutureLearn or the WordPress plugin BadgeOS may ultimately have an advantage over closed platforms like LRNG, especially as badging continues to find its footing. The Pittsburgh Galleries Project is an intriguing vision of the way museums and schools can partner to produce meaningful digital badging programs. The Galleries Project is part of Avonworth School District’s work to incorporate badges into its Pathways to the Future program, a rethinking of the traditional school to career experience. Pathways to the Future focuses on three core shifts: Personalization, Interdisciplinary Learning, and Use of Space and Time (Avonworth School District, n.d.). Avonworth hopes to scaffold these major shifts towards learning for the 21st century with a digital badging program. The district ultimately wants to go as far as including digital badges on student transcripts (Clare, 2016). The idea of a school district’s career program switching to badging as proof of learning, interest, and progress shows a potential future for badging programs, an idea which could be particularly relevant to museums, as school districts seek community partners who agree to help develop and issue badges. The Avonworth School’s DML 6 grant shows how badging can benefit museums. The grant focused on Avonworth’s Pittsburgh Galleries Project, a part of the district’s Career Pathways Program since 2013. The program relies on six museum partners throughout the city: the Andy Warhol Museum, Carnegie Museum of Art, Children’s Museum of Pittsburgh, Mattress Factory, Pittsburgh Glass Center, and the Toonseum of Pittsburgh. The website for the initiative explains “With this project student teams work alongside museum and gallery professionals to, at first, learn about the behind-the-scenes world of art museums and galleries, and then to curate exhibits on the Avonworth High School campus with their partnering museums” (Avonworth School District, n.d.). For museums, this model of professional exploration and development has real potential. The framework and partnership succeeds in introducing young people to the field without the ethical implications of unpaid internships. Not only is the Galleries Project an interesting vision of how museums can be involved in badging and credentialing, it also demonstrates badging’s potential use for museums’ human resource and hiring departments. Museums wondering how to hire fairly, for skill rather than personal connections, should keep an eye on badging, and might consider advocating for it in their museums and the wider credentialing community. For schools, the Galleries Project partnership introduces students to a career path rarely explored in traditional settings. In his blog posts for the DML 6 grant, Avonworth School District Assistant Superintendent Ken Lockette explains that students who take part in the program, “…do not have to be enrolled in an art class to participate, giving all students the chance to participate, even if their schedule does not allow time for a studio arts or graphic design course.” (Lockette, 2016). One of the main advantages of an interest-based badging system is the low level of investment for students; it allows exploration outside traditional fields. And, since the Pittsburgh Galleries Project has allowed students to explore work from exhibition lighting to museum education, it shows that a wide range of skills learned in one industry can apply to many different fields. The Galleries Project allows museums to get involved in developing intelligent, interested, well-rounded learners. The Pittsburgh Galleries Project shared many of the same features that made other badging programs successful: the respected reputation of a school district, partnerships with local experience providers, existing content, and a need to prove that learners had grasped that content. Despite the success of the Galleries Project and the school district’s interests in badging generally, in Lockette’s final blog post for the DML 6 competition, he cited many of the same concerns that cause others to feel hesitant about badging: “Moving forward, questions remain: 1) what currency do the badges hold? 2) how can the badges be leveraged with post-secondary institutions 3) how can equal access be given to all students to access the online platform.” (Lockette, 2017). In a chicken-and-egg scenario, many feel that others must accept the value of badging before they themselves invest in them. While the Avonworth School District plans to continue moving ahead with its badging program, questions of worth and access remain for them and for others contemplating badging. Balboa Park’s Art and Science of Vision project came about not because of badging, but because of an affinity for the playlist model put forward by LRNG. Home to more than 27 museums and cultural institutions, Balboa Park is an exciting place for learners of all ages. Visitors can explore topics from world styles of dance, to fossils and skulls, to a wide array of artistic mediums and movements. Balboa Park Online Collaborative (BPOC), founded to provide affordable technology services and innovation to non-profits in Balboa Park and beyond, had already been thinking of playlists as a metaphorical framework to connect Balboa Park’s seemingly separate content areas in unexpected and serendipitous ways. Seeing an opportunity to pilot the playlist idea, BPOC partnered with three museums: the Fleet Science Center, the Museum of Photographic Arts, and the San Diego Air and Space Museum, to apply for a DML 6 grant. Together, educators from each museum discussed areas of intersection, and settled on an idea for a playlist that focused on exploring optics. Drawing on the museums’ expertise in photography, aerospace, and science, the team envisioned a framework in which learners could create personal pathways toward the discovery of how humans perceive and interact with the world around them. These experiences would result in badges that would unlock the opportunity for free museum admission and, ultimately, the chance to gain professional experience in Balboa Park. While educators had an idea of what the playlists could look like, the project team wanted to hear from the audience—the teens who would be exploring playlists and earning badges. The team turned to its partners in local schools and designed a series of focus groups for teens in grades nine through 12, intended to answer a few big questions: What sort of games and activities hold teen interest? What types of activities would they have the resources to complete? What type of reward or credentialing would motivate them to complete a playlist? Drawing on the design-thinking process, the project team asked teens what devices and games they already use, then had them brainstorm how these activities could be used to create learning experiences. Teens wanted ways to engage and compete with peers who were also using the platform. Though preferences and technology use differed, overall themes of wanting to learn through games, social experiences, and most especially, video emerged (Falkowski, 2016). The project team worked hard to build engaging video content for learners, and solicited audience input at every step of the way, from the language used to the actual design of badges. The project team hoped that this approach would lead to engaging learning experiences that used museum objects to introduce teens to important ideas and concepts. Ultimately, the team produced three badges around the Art And Science of Vision theme: Motion & Distance, and Perception & Perspective. The teens enjoyed the various activities when the project team brought the final draft of content to classrooms. Teens’ creativity shined as they produced their own stop motion animation videos and optical illusion photos. Notably, teens made some glowing remarks: “Our math teacher is going to be so excited that we finally found a use for parabolas,” said one while making a camera obscura. Another commented, “If school was like this every day, I’d actually want to come.” As rewarding as these comments were, the group of testers needed serious guidance to stay on task and on track (Falkowski, 2017). If self-directed learning is a key part of digital badging, the project team did not accomplish it. The project team never managed to get learners familiar with and using the platform without adult prompting. While user-testing was important, and the learning experiences met the needs and wishes of teen learners, they were still just another activity—one where the benefits remained far less clear than those of school assignments, SAT prep, or a part-time job. In addition to, and perhaps partially because of, troubles with the self-directed aspect of the project, the team struggled to make it financially sustainable. The grant covered staff time as the project team went through user-testing and content creation, but since the end of funding, no resources remain to cover the monitoring and approval of existing playlist content or to create any additional learning experiences. Even though museums have plentiful educational content, the time it takes to translate that into a meaningful and attractive badging experience is significant. Not to mention the fact that the LRNG platform now has a cost associated with its use. Barring unforeseen circumstances, the Art and Science of Vision project will join the ranks of badging projects that came and went. The project team now recognizes some of the key factors that make a successful badging program, and realizes that some were lacking at the project’s start. Balboa Park certainly had the reputation, and the partnerships; the potential for great content was there, but creating content from scratch took up most of the team’s energy. In addition, the badging program was not fulfilling a need, but creating one. The grant did have the positive effect of helping the team become familiar with digital badging. If they were to approach it again in the future, they would have a better idea of how to implement it in a sustainable way. Indeed, now that the project team understands the model, they see potential applications everywhere. Could it be used to improve field trips? Summer camps? After-school programs? Adult offerings? The DML 6 grant was enough to get Balboa Park educators familiar and comfortable with the concept of digital badging, but not enough to build a lasting and useful credentialing program. Imagine a future in which learners of all ages engage with museum resources in order to earn badges that represent real-world, marketable skills. Aspiring coders might create a website about a piece of art to earn an HTML badge. Budding journalists might write a newspaper-style article about a lecture they attended to earn a writing badge. These badges would appear on learner’s LinkedIn profiles and stick with them for life, helping them as they look to prove their credentials to future employees. In this vision, museums take a well-deserved place in a rich learning ecosystem. Museums, hesitant to fail and waste funding, or worse, lose credibility for future funding, are not always comfortable being early adopters of new technologies or frameworks such as digital badging. One-time exploratory grant opportunities, like those offered as part of the DML competitions, allow for vital experimentation, but digital badges will never get beyond the fledgling stage without a long-term plan for sustainability. Schools do not have the resources to truly pioneer this new system, nor do educational content creators, such as museums. The impetus for digital badging has to come from employers, who have the resources to take risks, and increasingly find themselves lacking candidates with the skills they need. This is already happening as companies like IBM invest in and advocate for digital badges as credentials. While many museums have started and stopped involvement over the past few years, badging remains a rapidly evolving landscape. Should museums jump on the digital badge bandwagon? Not necessarily—at least not yet. Key questions remain about badging. Who decides a credential’s value? Can badging be a more effective motivator than existing educational frameworks? A more effective proof of skills? Museums who do try badging programs should look to answer these questions as well as making sure they are drawing on their reputations and partners, and looking for existing content that would benefit from a reframing. When these factors are in place, badging programs are much easier to sustain. Digital badges can take many forms, and at the very least, get museums thinking outside the box about the kind of educational content they’re producing and what to do with it. Badge earners and museum learners don’t have to be students on field trips; they can be adults preparing for new careers, or individuals hoping to work in our museums. Museums interested in starting badging programs should think about the factors that have led to successful digital badging in the past. As the U.S. educational landscape shifts, and museums wonder what their role can be in these changes, they would do well to keep a close eye on digital badging. As major employers and educational institutions start accepting and issuing digital badges, museums should be sure they are involved in the conversation. Museums should not let the potential to serve audiences in this new and important way pass by. Thanks to the whole Art and Science of Vision team, including amazing our videographer and collaborator, Drew Mandinach. Thanks to the LRNG team, especially Kiley Larson and James Halliday, who were my guides into the world of connected learning. Avonworth School District. (n.d.). The Pittsburgh Galleries Project. Consulted January 14, 2018. Available http://avonworthsd.wixsite.com/pittgalleriesproject. Clare, E. (2016). “Finding the Road to Travel By.” Partnership for 21st Century Learning. Consulted January 14, 2018. Available http://www.p21.org/news-events/p21blog/1945-finding-the-road-to-travel-by. Dallas Museum of Art. (n.d.). DMA Friends. Consulted January 14, 2018. Available https://www.dma.org/visit/dma-friends. Digital Media and Learning Competition. (2016). Consulted January 14, 2018. Available https://www.hastac.org/blogs/dml-competition/2016/09/13/congratulations-dml-6-playlists-learning-challenge-grantees. Falkowski, J. (2017). “Art and Science of Vision: Reflections.” Consulted January 14, 2018. Available https://www.hastac.org/blogs/bpoc/2017/05/31/art-and-science-vision-reflections. Falkowski, J. (2016). “Starting at the Source: Getting Teen Feedback Regarding Online Learning. HASTAC. Consulted January 14, 2018. Available https://www.hastac.org/blogs/bpoc/2016/12/29/starting-source-getting-teen-feedback-regarding-online-learning. HASTAC. (n.d.). Digital Badges. Consulted January 14, 2018. 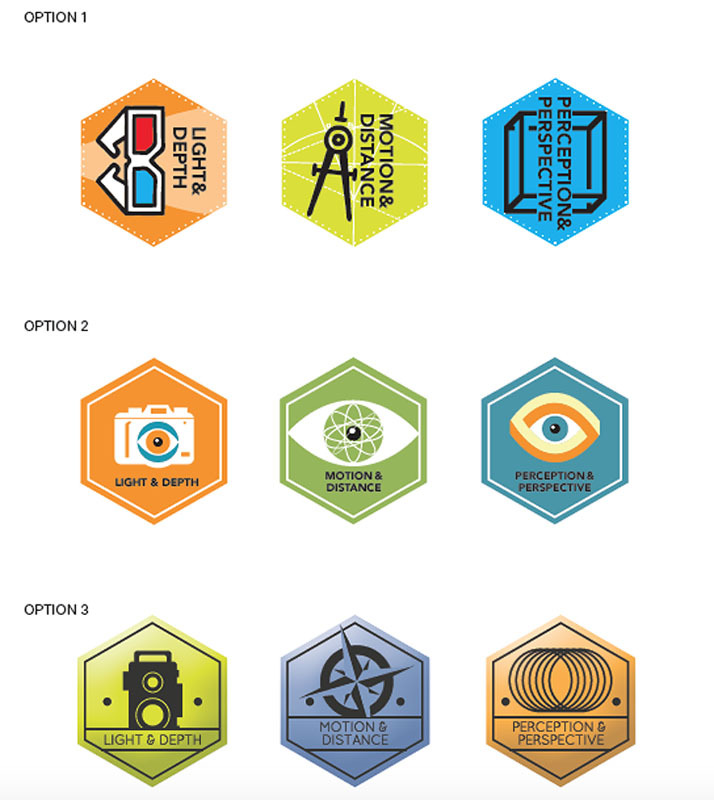 Available https://www.hastac.org/initiatives/digital-badges. Iafrate, M. (2017). “Digital Badges: What Are They and How Are They Used.” ELearning Industry. Consulted January 14, 2018. Available https://elearningindustry.com/guide-to-digital-badges-how-used. Kerr, M. (2018). Personal Interview. January 4, 2018. Leaser, D. (2017). “Northeastern University + IBM: Turning digital badges into academic credentials will create opportunities and better college graduates.” IBM. Consulted January 14, 2018. Available https://www.ibm.com/blogs/ibm-training/northeastern-university-ibm-turning-digital-badges-academic-credentials-will-create-opportunities-better-college-graduates/. Leaser, D. (2016). “IBM Badge Program: Overview for External Audiences.” LinkedIn Slideshare. Consulted January 14, 2018. 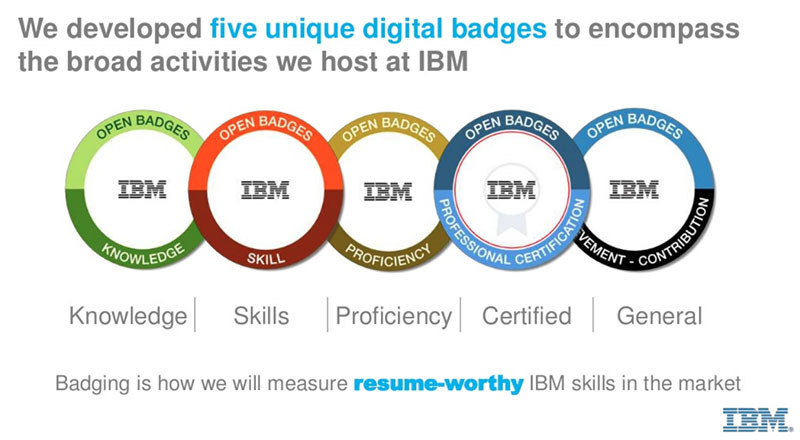 Available https://www.slideshare.net/DavidLeaser/open-badges-at-ibm-overview-for-external-audiences. Lockette, K. (2017). “Pittsburgh Galleries Project Badging.” HASTAC. Consulted January 14, 2018. Available https://www.hastac.org/blogs/klockette/2017/05/31/pittsburgh-galleries-project-badging. LRNG. (n.d.). About. Consulted January 14, 2018. Available: https://www.lrng.org/about. LRNG Chicago (n.d.). “LRNG CHI: One Summer Chicago Pilot.” The Chicago Community Trust. Consulted January 14, 2018. Available http://cct.org/wp-content/uploads/2016/10/LRNGCHI_WrapUpReport2016.pdf. Mozilla Foundation. (n.d.). “About Open Badges.” Open Badges. Consulted January 14, 2018. Available https://openbadges.org/about/. Mozilla Foundation, Peer 2 Peer University, & MacArthur Foundation. (2012). Consulted January 14, 2018. Available https://wiki.mozilla.org/images/5/59/OpenBadges-Working-Paper_012312.pdf. Resnick, M. (2012). “Still A Badge Skeptic.” HASTAC. Consulted January 14, 2018. Available https://www.hastac.org/blogs/mres/2012/02/27/still-badge-skeptic. Rodley, E. (2012). “Museums and Digital Badging.” Center for the Future of Museums. Consulted January 14, 2018. Available http://futureofmuseums.blogspot.com/2012/12/museums-and-digital-badging.html. Smithsonian Learning Lab. (n.d.). Looking for Smithsonian Quests? Consulted January 14, 2018. Available https://learninglab.si.edu/help/smithsonianquests. Stein, R., E. Cassidy, J. Finkelstein, A. Fulton, D. Hegley, A. Heibel, K. Tinworth, B. Wyman. (2015). “Scaling up: Engagement platforms and large-scale collaboration.” MW2015: Museums and the Web 2015. Published January 30, 2015. Consulted January 14, 2018. Available https://mw2015.museumsandtheweb.com/paper/scaling-up-engagement-platforms-and-large-scale-collaboration/. Yowell, C. (n.d.). A Letter from Our CEO Connie Yowell. Consulted January 14, 2018. Available http://collectiveshift.org/ceo-letter/. Falkowski, Julia. "What are your credentials? Museums, education, and digital badging." MW18: MW 2018. Published January 14, 2018. Consulted .